Healthy brown rice and broccoli, a creamy sauce and savory chicken, topped with crispy French fried onions. 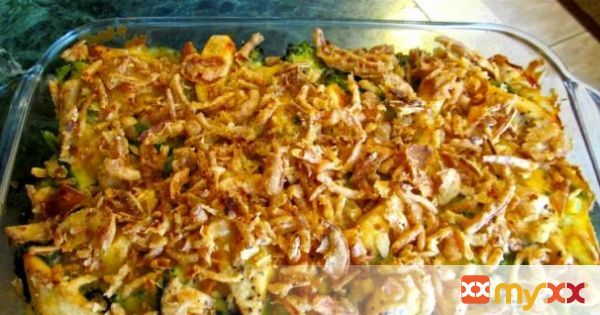 A delicious chicken & broccoli one dish casserole! 1. Preheat oven to 350 degrees F and grease a 7" x 11" baking dish. 2. Cook the brown rice as directed on package. We used minute brown rice. 3. Cook and drain the broccoli, then sprinkle the salt evenly over. 4. Cut the chicken into pieces. In a sauce pan over medium heat, brown and cook the chicken in the olive oil. Remove chicken from pan and set aside. 5. In the same sauce pan, combine the cream of chicken soup, milk and pepper. Cook and stir over medium heat until smooth and bubbly. 6. Layering: Spread the brown rice evenly in the bottom of the prepared baking dish. Layer the broccoli, then the chicken pieces. Pour the cream of chicken soup mixture evenly over everything. 7. Bake in a preheated 350 degrees F oven for 25 minutes. 8. Sprinkle the French fried onions evenly on top and bake an additional 10-15 minutes (40 - 45 minutes total), or until the French fried onions are golden brown and crispy.